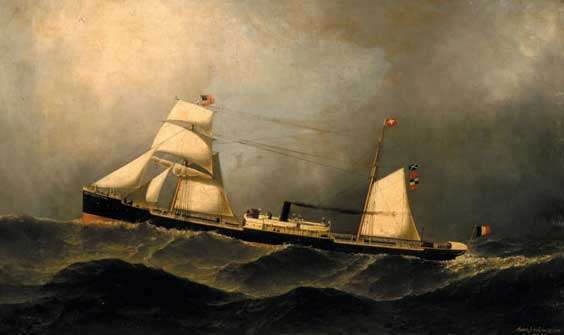 Fog and stormy seas were blamed for the loss of the iron steamship Daniel Steinmann on Mad Rock Shoal while approaching Halifax Harbor on April 3, 1884. A total of 121 passengers and crew members perished in the disaster. Captain Henry Schoonhoven, one of only nine people to survive the wreck, said he steered the ship toward what he thought was the Chebucto light as he attempted to fix his position on a course into Halifax, but discovered his mistake too late. When soundings revealed that the water was too shallow he said he ordered the helm “hard aport," but it was too late. The steamer struck "heavily” at about 9:25 p.m.
Schoonhoven said he ordered the ship’s anchors dropped and the lifeboats launched. After striking the ship drifted off toward the coast and the captain said he could see heavy breakers ahead. He said passengers and crew members on the deck attempting to get away in lifeboats and where caught when the wreck was slammed by a giant wave that swept nearly everybody overboard. The vessel then settled upright in about 80 feet of water, with the tips of the masts still showing. The captain said he was near the bow of the ship, checking to see if the anchors were holding when the wave struck. He said he was pulled down with everybody else but managed to swim to the surface. There he grabbed a mast and hung on. While there he said he grabbed a young man named Saco Nikole, who was a passenger bound for New York. Together they clung to a mast for seven hours until they were rescued. Schoonhoven said the Daniel Steinmann had been steaming through fog for several days, on a route from Antwerp to Halifax, Nova Scotia, so he was unable to take bearings from the stars. He said he was relying on compass readings alone and battling a winter gale which accounted for the ship being off course. Another survivor, seaman Fritz Nich, said he was at one of the life boats at the stern and was cutting it adrift when the wave struck and the ship foundered. He said the boat was rushed by a number of people who jumped into it. Not all of the ropes to the boat were cut and it was pulled down with the ship. Nich said he managed to get to the jolly boat with a few other people. This boat got away from the steamer and carried survivors to nearby Sambro Island. The 277-foot steamer was launched in 1875 as the Khedive. It was rigged as a barquentine although it was equipped to operate under steam power. The ship, owned by the White Cross Line of Antwerp, Belgium, carried both passengers and general cargo.